LOCATION - Just two blocks south of Main Street shopping, restaurants, churches and festivals. BATH - Clawfoot tub with handheld shower. AMENITIES - Central heat/air, Cable Flat Screen TV/DVD (some movies provided), wireless internet, bike storage available, Barons Creek on property, fully-equipped kitchen, large private porche with views, easy walking to shopping, restaurants, churches and festivals. The kitchen is fully equipped with range/oven, small refrigerator, microwave and coffeemaker. A glass table is comfortable for four people. Just outside the suite is a long porch... perfect for relaxing and visiting. Comfortable seating areas are on the porch. It was a wonderful place and a great loaction. Clean and stocked with items most place dont have. Frank was a friendly host. We had another couple with us in the 2nd "apt" was just as lovley. Great place for a couple! My wife and I have stayed here several times and it remains our favorite place to stay in Fredericksburg. The price, accommodations, and location can't be beat. Wonderful place to stay. This was our third time and we plan on coming back many more times. The room is so homey. It has everything you could possibly want or need. Frank, the host, is very nice and friendly. The people in the main office are always nice and welcoming. Location is great. Walking distance to main street. We are already planning our next visit and can’t wait!!! Perfect for our weekend in Fredericksburg. We initially had a place booked 20 minutes outside of town, but we were fortunate enough to pull-off a last-minute switch to Cyclismo. This change was a huge factor in the success of our weekend. It's not overly-fancy and there's nothing formal or uptight about Cyclismo. It's simple and straightforward, and it's got everything you need for a perfect weekend away. Frank was a pleasure as a host, and we always looked forward to our walks back to the house after our adventures on the Main Street. The only *strange* part of the place is that there's no shower. Once we realized this, I found myself taking my first ever bath as an adult. It actually ended up being quite relaxing, once I figured out what I was doing. When we go back to Fredericksburg, we will always try to book Cyclismo and hope that it's available. This is a great find for my wife and I. We went to Fredericksburg for our Anniversary and Franks Place was great. Very close to Main Street and Frank is an absolute Gem!! Thanks Frank! Great apartment, walking distance to everything! We parked our car and didn't get in it again until we left. Check-in and check-out was a breeze with the Gastehaus Schmidt team. The owner Frank was super friendly and accommodating. We will certainly return when we come back to Fredericksburg! It was very comfy feeling with a front balcony all your own. Frank the owner lives on the property and is very helpful. Not far from the main drag of Fredericksburg. If you have issues with stairs this suit is not for you. Number 3 would be perfect for you. It also has a back porch. I give this place 5 stars. Perfect. Just steps away from main street and the porch was amazing. Cyclismo - a great B&B! This is a great B&B! Very clean, well equipped and peaceful. 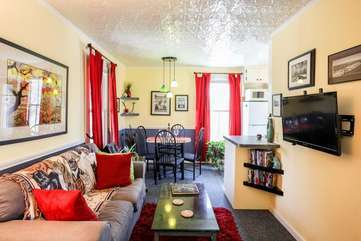 Close proximity to downtown / Main street (walking distance). The snacks and drinks provided were a nice touch. There is nearby road noise (Adams St.) but that is not the property's fault. Overall a great experience - I would stay here again! Loved it! The place is cozy and an easy walk to Main St.
Had an amazing time! The place was so cozy and comfortable that it felt like we were staying in our own apartment! It was also only about a block away from main street where there was plenty of shopping, bars, and restaurants! We will definitely be reusing this place in the future! We loved our 2-night stay at Cyclismo. Frank was helpful and we loved the accommodations, tastefully renovated.